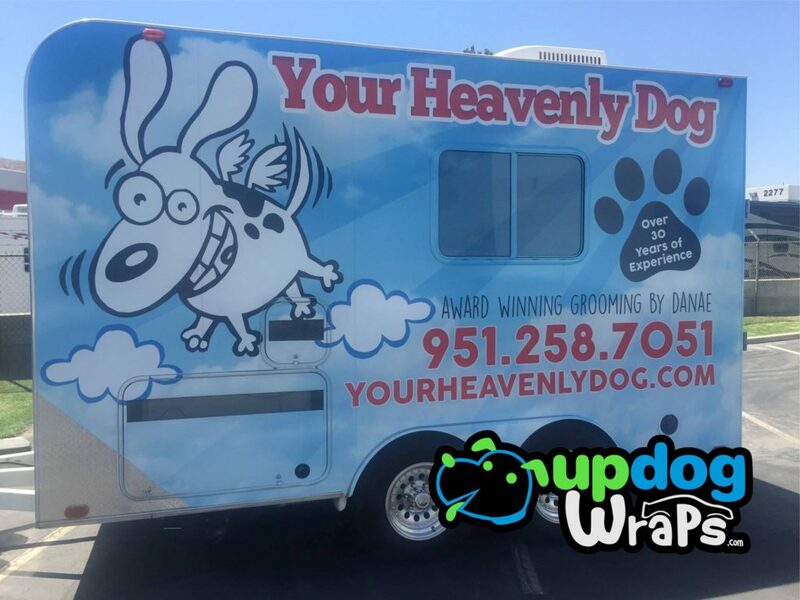 It was a match made in heaven when Danae Betzer, looking for a brand new trailer wrap to support her mobile dog grooming business, discovered UpDog through a Google search. Our canine-themed branding resonated with her love of animals, our solutions met her business needs. She developed a joy for working with our team, as much as we love working with her! We started with an initial consult to help us better understand her business, and the scope of her trailer wrap project. After talking with her, we learned that Danae and her husband, a church planter and pastor, recently moved back to the Southern California to plant a new church. To prepare for their move, Danae most recently sold an award-winning dog grooming business she built from the ground up in Fairview, Tennessee. Her 30 years combined training and experience made her business very successful, earning such accolades as the Fairview Observers Reader’s Choice Award for Best Dog Groomer for four consecutive years. 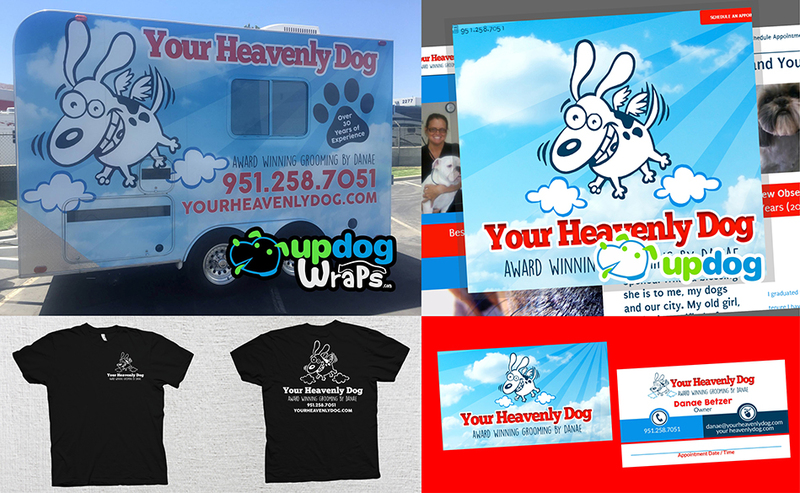 Today, Danae is re-building her brand for a mobile dog grooming business based out of Corona. The next step was to connect Danae with one of our talented designers, Alissa. 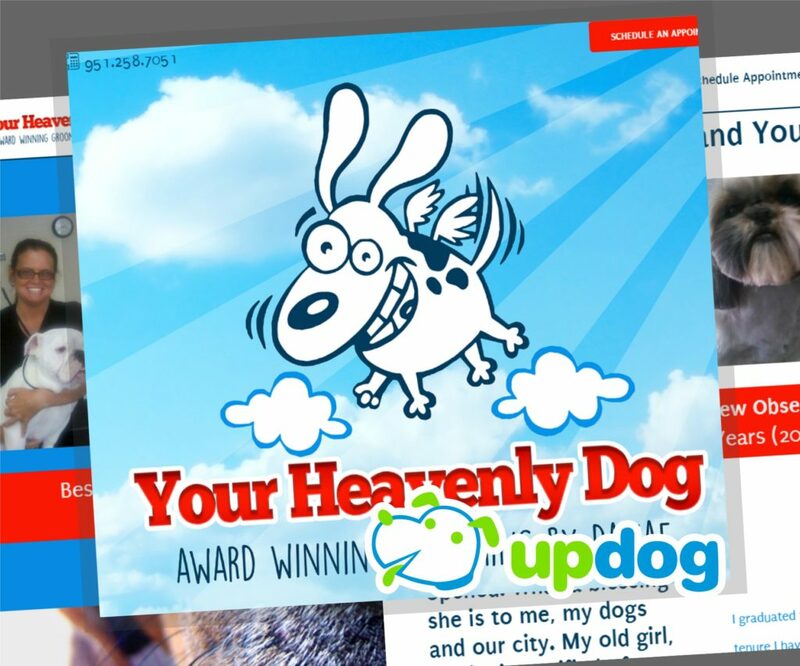 They worked closely to develop a new logo design for Your Heavenly Dog. We then extended that branding to a beautiful full trailer wrap design. While working on her trailer wrap, we learned that Danae needed an online presence for her brand as well. Our digital marketing team put together a free preview website that matched perfectly with the new branding. We had the preview ready for Danae to look at when she would be dropping off her trailer to be wrapped. Nothing made our team happier than to see how much she loved it! More importantly, Danae would have information hub that prospective customers could find online to learn more about her business and contact her to schedule an appointment. We worked with Danae on her next trip back to pick up her trailer to make some revisions to the website. Today, it’s live. We also were able to help Danae with her t-shirts and business cards. And we love that we get to continue our working relationship with her by provide ongoing support and maintenance for her website. “I have been grooming dogs as long as I have because I love them! They are my heart and God has given me a gift of making them feel and look beautiful. Proverbs 12:10 says, ‘The righteous care for the needs of their animals.’ And I live it every day in my business.” Check out www.yourheavenlydog.com for more information about Danae’s dog grooming services at Your Heavenly Dog or to schedule an appointment. Supporting local businesses and working side-by-side with our customers to develop and provide marketing solutions is our passion. We would love to help you Mark Your Territory! Contact us today at 1.800.393.6802 or click here to request a free quote!